After a couple of packed convention years, 2015 has been deliberately convention-lite for me. Lot going on work-wise and just enjoying my weekends down here on the Kent coast. But… it’s all systems go for August with not one but TWO convention appearances to shout about. First up is Dublin Comic Con (Aug 8th-9th) at the Convention Centre in, um, Dublin. One of my favourite cities, so no way was I saying no to this one. Plus, I have it on good authority that it’s a great and growing convention, with guests and dealers galore. I’ll be joining the likes of David Lloyd, Erik Larsen and homegrown talent in the shape of Declan Shalvey and Stephen Mooney, plus many others (from comics and TV/film). I’ll be doing the usual round of panels, one dedicated to 30 Year of Transformers, Q&As, and I’ll be at my table with RG1 Comic/Script packs for sale. Pop by and say hello if you can. For more details and to buy tickets you can check out DCC’s site here. 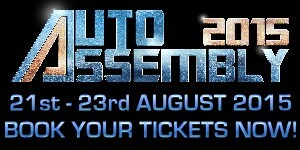 Then it’s the turn of Auto Assembly, in Birmingham, Europe’s biggest dedicated Transformers convention (Aug 21st-23rd), a two or so day extravaganza of all things robots in disguise. Sadly, this is the last AA for the foreseeable, so do try and come along (especially if you’ve never been before). It’ll be a feast of guests, panels and events, including the amazing cosplay competition (always worth seeing) and the live voice actor drama. There’ll be a host of Transformers comics creators in evidence, and I’ll be doing a panel or two, one of which is my illustrated tour through the fall of Dreamwave and the rise of IDW, featuring some amazing (and unpublished) art. I’ll be bringing plenty of stuff for sale or just signing whatever’s thrust under my nose. Don’t miss out on what’s destined to be its own little Transformers landmark event. For more information or to book tickets check the Auto Assembly website here. You are currently browsing the simon furman blog archives for July, 2015.